Meghan Markle once again turned heads as she arrived in Northern Ireland on Friday dressed for the early spring weather. 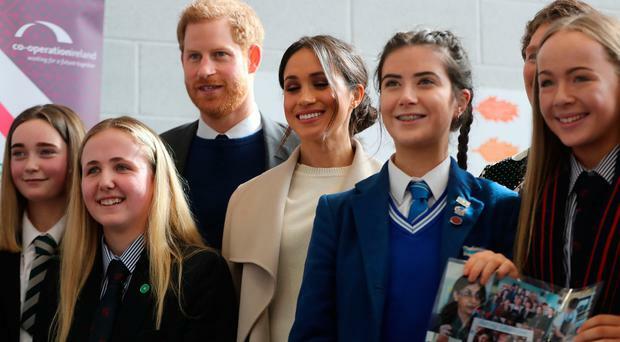 The US actress joined Prince Harry in Lisburn and Belfast as part of their pre-wedding tour of the UK. With all eyes once again on Meghan's choice of clothes, she arrived in a stunning beige midi waterfall coat from Canadian brand Mackage, which costs just over £500. The actress also wore a cream jumper by Victoria Beckham paired with a vibrant green skirt from Greta Constantine. Meghan completed the look with a pair of burnt orange Jimmy Choo heels and a top-handed bag from British brand Charlotte Elizabeth.